Holes in the middle and left. 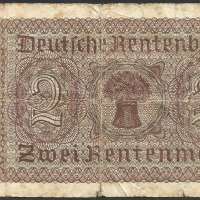 First issued on 15 October 1923 and this particular banknote was issued on 30 January 1937. 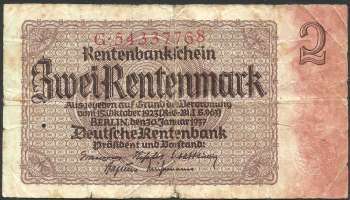 Emergency currency issued in 1923 by the German government during the Weimar Republic to help control runaway inflation. Those who imitate or counterfeit banknotes or distorts or falsifies, procures and markets it, is punishable with imprisonment of not less than two years. Thank you to Sheriff James 'Jim' L. for the banknote to be added into my collection.